Terminate twelve fiber connections using a single 40 Gigabit network cable - designed for high-density fiber networks. 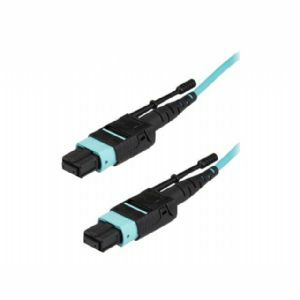 This MPO/MTP fiber optic cable houses 12 fibers and lets you interface between different networking devices of varying speeds. For example, you can set up a one-to-one connection between two 40Gbps switches or servers. Alternatively, you can connect a 40Gbps switch and break out the 40Gbps into six duplex 10Gbps LC connections on a patch panel or network cassette, which then fans out to individual 10Gbps devices. The MTP connector provides twelve times the density of an SC connector and saves circuit card and rack space. Plus, the push-and-pull tabs optimize accessibility and let you install or remove the connectors with one hand, without having to use additional tools.